Cllr Pritchard was in senior management with four ‘blue chip’ companies over 40 years, gaining a wide range of skills during this time. He has been a member of various voluntary organisations over the past 50 years, including being President of the Football Association of Wales and representing Wales on both FIFA and UEFA, the International Governing Bodies of Football. He is also a Director of the Welsh Football Trust and is Patron of the Spar Mid Wales League. 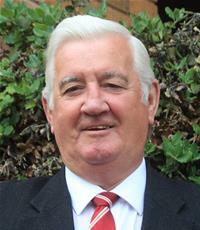 He is currently a member of Welshpool Town Council. As a Powys Councillor he sits on a range of outside bodies, including the Mid and West Wales Fire and Rescue Authority. This is his second term of office with the National Park Authority.